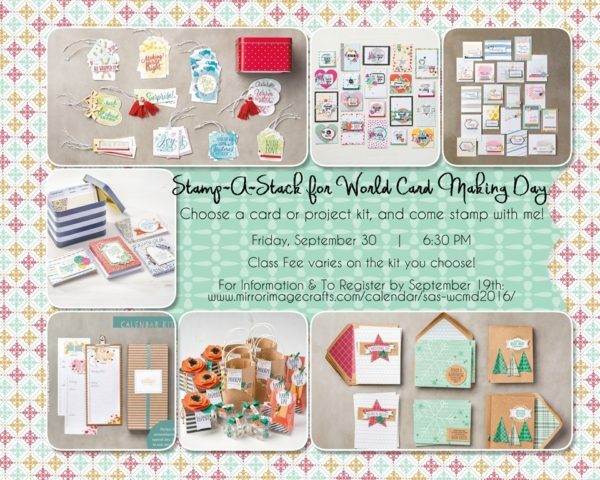 Join me for this year’s Stamp-A-Stack for World Card Making Day! This year I am doing the event a little differently – since my house is still undergoing some renovations I wouldn’t have the time to plan, order and prep my typical Stamp-A-Stack, so you get to pick your own kit! This means you could choose to not even make CARDS this year – you could make gifts or tags! I’ve missed having classes, so I hope you’ll join me! Register to attend no later than September 19th so I have plenty of time to order your kit and other supplies.